We need User Profile Service Application to consume social features in SharePoint 2016 such as My Sites, User profiles, etc. This PowerShell script creates User Profile Service Application in SharePoint 2016. $ServiceAppName = "User Profile Service Application"
$ServiceAppProxyName = "User Profile Service Application Proxy"
$AppPoolName = "Service Application App Pool"
Write-Host -ForegroundColor Yellow "Checking if the Managed Accounts already exists"
Write-Host "Please Enter the password for the Service Account..."
Write-Host -ForegroundColor Yellow "Checking if the Application Pool already exists"
Write-Host -ForegroundColor Green "Creating Application Pool..."
Write-Host -ForegroundColor Yellow "Checking if User Profile Service Application exists already"
Write-Host -ForegroundColor Green "Creating User Profile Service  Application..."
Write-Host -ForegroundColor Yellow "Starting the User Profile Service Instance..."
Write-Host -ForegroundColor Green "User Profile Service Application created successfully!" Once the script execution completed successfully, you can go to Central Administration >> Application Management >> Service Application Page to verify user profile service application is created. Next step: As for next step, Configuring user profile Import or synchronization by Create a user profile connection and starting a full profile import. 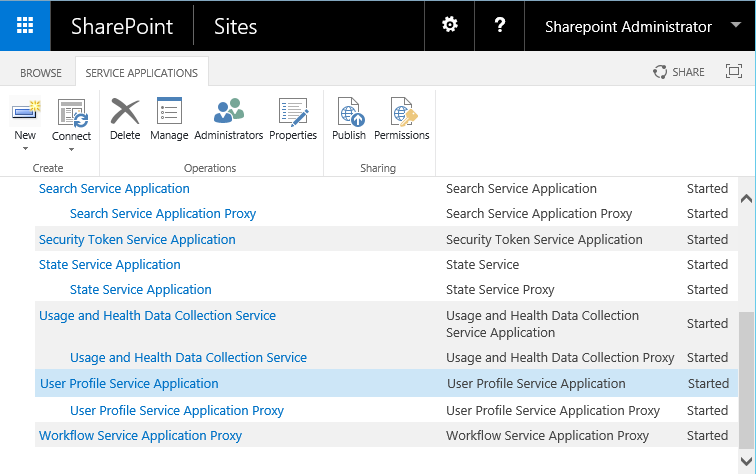 Here is how to add new connection for user profile import: How to Add a user profile synchronization connection in SharePoint 2016? I read your all articles ,honestly your great jobs,If you don't mind I want to request to you please create a separate label of article for SP RestAPI with real word scenario based. SharePoint Online: Save List as Template Missing?